Governance from the centre that is not based on knowing better than those at the edge. What identifications are supported on dispersive ground? 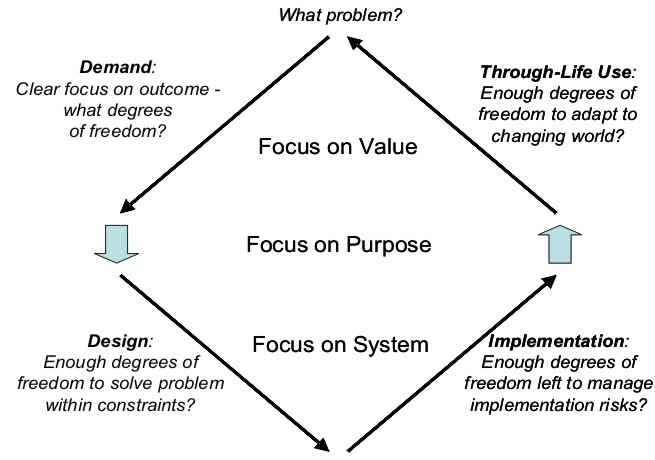 The conditions for triple-loop learning require that the enterprise becomes edge-driven. This places it on dispersive ground. The identifications that need to be supported on dispersive ground are those involving triple-loop learning. These identifications keep the organisation on the deliberative ground of politics on which differences can be worked through within East-West dominant forms of governance. Refusal to engage with this leads to three other kinds of competitive behavior (Tai Chi, Sumo and Samurai), the consequences of which become most apparent in warfare. Consider the balance between the will of the people involved with a membership organisation (ranging from a majority to particular networks of members) and the means acceptable to the people of the organisation (ranging from by-any-means to means restricted by the extent of collateral damage). This is based on military ways of thinking about the relation between different types of warfare and politics. It provides an insight into what is at stake for the leadership of an organisation dealing with growing differentiation in the demands of its members. With alignment, there is a symmetry between the will of the members and the means adopted by the organisation. Without alignment, there is an asymmetry. Insurgent operations are the consequence of not responding to members’ demands for differentiation of behavior, combining the limited will of a network of members with no restraints by them on the damage they inflict on the ‘others’ who do not agree with them (i.e. being on difficult/bad, serious/deep or frontier ground). 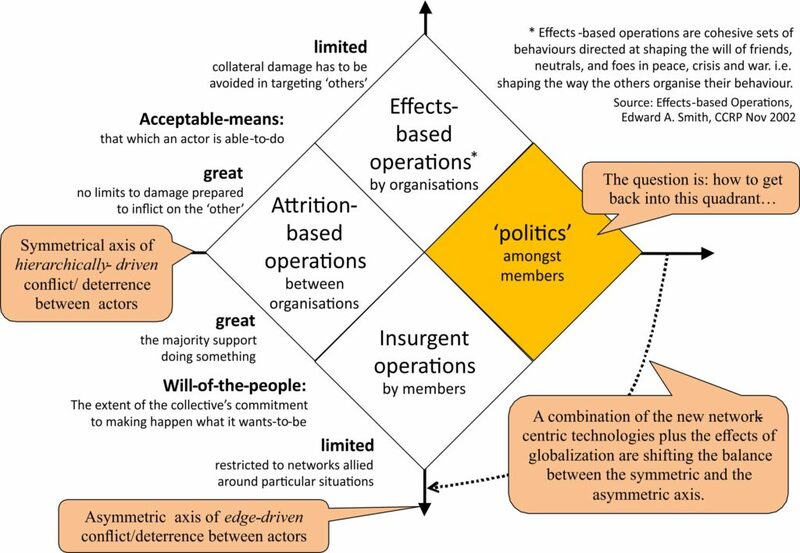 Effects-based operations are the response by the majority of the people of the organisation to suppressing the will of those who do not agree with the majority, a highly targeted response that limits collateral damage beyond the networks in disagreement (i.e. being on focal/intersecting, encircled or communicating ground). The danger of either asymmetric response arises from its enabling the organisation to postpone responding to and providing support for the growing heterogeneity in the way members meet demands. The challenge, of course, is for the organisation only to accept asymmetric responses as being on the way to operating on the dispersive ground of ‘politics’, ground on which growing difference may be lived with and supported – presenting leadership with the task of leading an organisation without boundaries. Tai Chi – do not confront the other’s organisation on its terms – most appropriate on serious/deep ground (aka insurgency). Samurai – challenge the other’s behaviour ruthlessly wherever you meet it – most appropriate on encircled ground (aka effects-based operations). Sumo – dominate the chosen ground by weight of presence – most appropriate on death ground (aka the other’s attrition). Death ground is ground defined by the organisation’s formation being defined wholly by its affiliation to a past intent and not by its relation to the current situation(s) on the ground – it is as if the organisation has no choice but to fight to the death, which in an environment demanding dynamic alignment is very likely to be its own death! Deliberative process is not to be confused with consultative process. The goal of e-Government is to enable government to become more responsive to its citizens while at the same time reducing its costs. We did a study for a government that wanted to invest in the use of on-line search capabilities. The problem the government faced was that there were insufficient direct revenues or savings to set against the value of such an investment, so that the normal approaches to establishing Return on Investment (ROI) would not work. The approach we took was to approach the demand for on-line search capabilities as multi-sided, in order to establish the indirect value of the investment. P-type: responses needing wholly new kinds of response, frequently requiring collaboration with organisations outside government (e.g. what precautions do we need to take for our school excursion). We examined actual queries, establishing their variety and frequency and how these factors changed as the knowledge relating to any given domain of query matured (e.g. for swine flue in this case). We represented these queries in a multi-sided matrix, in which the columns represented individual services provided by different departments and organisations; and the rows were the different types of query. A pattern of X’s along a row thus represented the collaboration between services needed to respond to the query in that row. The matrix as a whole represented the variation in forms of collaboration needing to be supported by the architecture of the search platform. 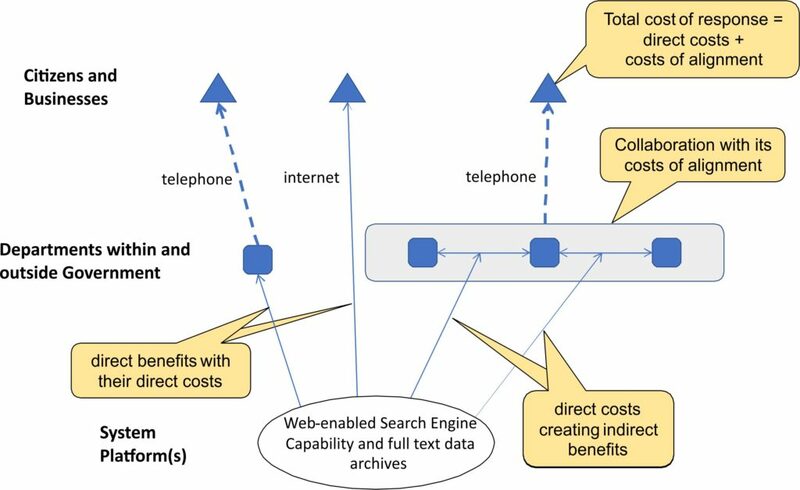 In the case of the r-type and c-type queries, direct benefits flowed from the direct costs of using on-line search. But in the case of K-type and P-type queries, the indirect benefits that flowed from the impact of these direct costs were based on the government’s costs of alignment across the variety of collaborations. We were able to analyse the value of these indirect benefits based on Monte-Carlo simulation of the change in the way the organisation could work using the search platform. The multi-sided character of the demands that queries made on the government departments created a clear need to take into account the government’s costs of alignment. These costs of alignment depended on the way the governance processes that the government used could dynamically align responses to changing and evolving queries (i.e. using distributed or collaborative approaches). This meant that the government could continue to consider the traditional economies of scale and scope available from any particular supporting department and systems platform. But it also meant that the government needed to develop a governance approach appropriate to e-Government – one that assumed variability in the needs of citizens creating multi-sided demands on government. Thus government had also to consider the economies of alignment it could secure in the way it responded to the resultant variation in the forms of collaboration demanded of it. In effect, the government had to change the way it was able to respond to its citizens. The paper was based on a more detailed report on the work itself. The collaborative approach depends on there being a service infrastructure agile enough to be under-determining of the way the customer’s demands can be responded to. 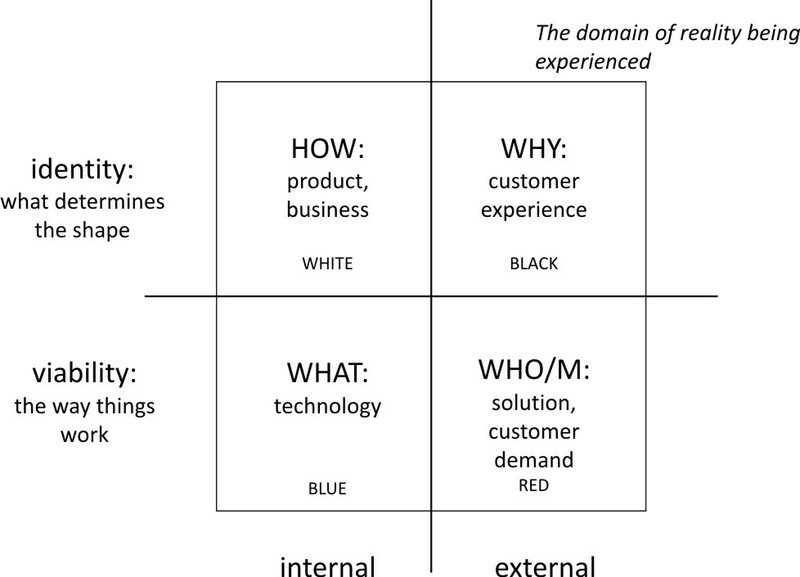 Put another way, the supplying business needs to find its edge where it can be structure-determining in how it responds to the customer, rather than being structure-determined by its infrastructure. At this edge, it is in a position to offer cKP services that can be responsive to the customer’s context-of-use. But how is it to work collaboratively with the customer in agreeing the nature of those cKP services? 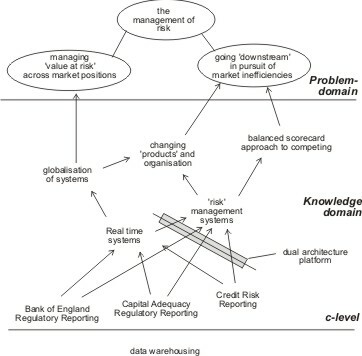 At the bottom of the diagram is ‘data warehousing’, understood to be a generic service that can be provided in a way that does not require knowledge of the specific bank’s situation, and ‘c-level‘ (it is always rising) is the level above which the bank’s specific context-of-use can no longer be ignored. 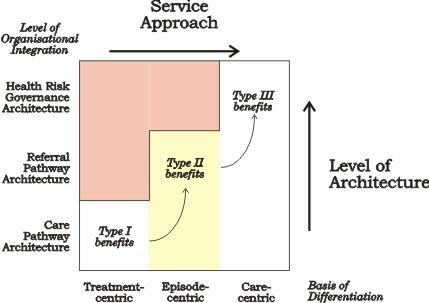 In between c-level and the problem domain is a knowledge domain, in which knowledge about the bank’s context-of-use enables cKP-type services to be offered. 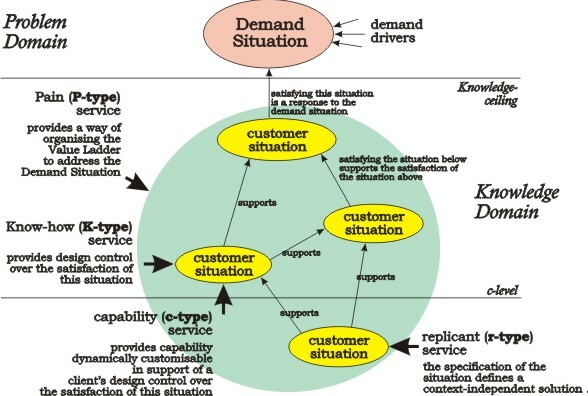 The situations within this knowledge domain then identify opportunities for the supplier to provide services that cumulatively build on each other to meet their larger need in the problem domain. This is an effects ladder, and it provided the bank customer and the computing services supplier with a framework within which to build a shared picture of the bank’s context-of-use. In the diagram below you see this generalised, with the relationship of rcKP services to the ladder. This adds the concept of a ‘knowledge ceiling’, being the level above which problems become too large to solve. An effects ladder is therefore a way of thinking through how such problems can be made tractable by bringing aspects of them below the knowledge-ceiling and/or raising the ceiling by becoming able to take on more of the complexity of the problem. Strategy-at-the-edge requires that a double challenge be met which balances internal changes with external opportunities. The effects ladder provides the means of agreeing with the customer how effects need to support their demand situation within their context-of-use. North-South dominance works when the environment can be assumed to be symmetrical to North’s assumptions about it. As the variety of actual demands on the organization increase, making this assumption increasingly less valid, it is useful to distinguish the faustian pact. This pact arises when the individuals at the ‘Easterly’ edge of the organization present what they are doing as if they are complying with North-South strictures in order to cut themselves some slack within which to do what is actually needed East-West (and perhaps also to protect their personal stake in the way they do their jobs). This can create a dangerous collusion which ends up insulating the North from the increasing complexity of demands the East is actually responding to because they are doing it within informal systems ‘under the radar’, for example through horizontal barter between budgets, or calling in personal favors. As a result, the Faustian pact delays the moment when the North learns from what is actually going on until presented with catastrophic breakdown of its North-South dominance. (I wrote about the effects of this delay under the heading of ‘facing facts: what’s the good of change’ within the context of the UK’s National Health Service, where doctors often find themselves having to ‘play the system’ in order to deliver appropriate care to their patients). 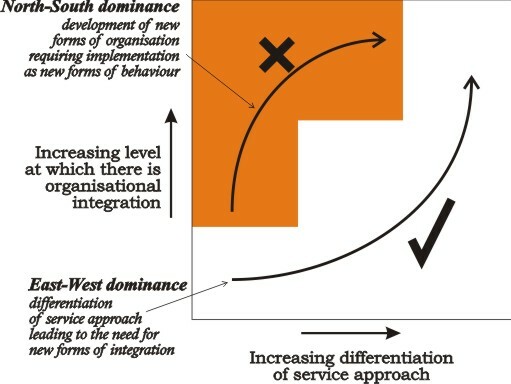 East-West dominance requires horizontally networked forms of organization that can hold ‘the edge’ accountable for the way it uses the resources of the supporting organization, but in relation to the way West’s know-how is used to respond to the particular demands arising in the East. This contrasts with the hierarchical forms of control associated with North-South dominance. What is at stake is the performativity of what is done in relation to the different demands at the edge, rather than the performance of what is done against centrally (symmetrically) defined criteria. It is not that hierarchy isn’t still necessary, but rather that it has to be pragmatically rather than universally defined. That’s where asymmetric design is needed.